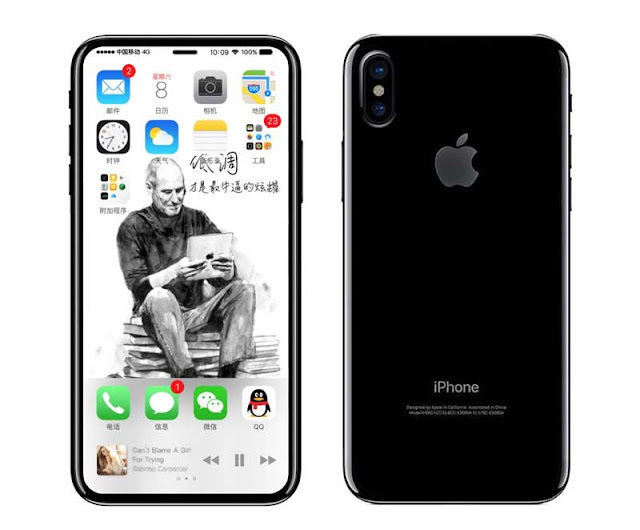 iPhone 8 or iPhone edition what every you call is expected to come in the month of September this year and as we approach the launch date rumors and leaks about the device is going to increase. As we all know a drastic change in the design of the device is expected this year from Apple and today adding too many leaks another leak about the device surfaced online and it seems closest one. The following set of images, posted by @OnLeaks, shows what will probably the final iPhone 8 design. We’re looking at the same iPhone 8 we saw in a bunch of recent leaks, featuring an almost bezel-less display that has no home button. There’s no home button on the back of the handset either, which indicates the Touch ID sensor will be placed under the screen. Other telling signs that suggest we’re looking at an iPhone 8 leak include the vertical dual lens camera on the back, the elongated standby button, and the camera-and-sensors setup that bites into the display. Apple is far from confirming this design, but, at this point, this seems to be the most likely scenario for the iPhone 8. Why are they important? Because it looks like some companies, probably in China, went through all the trouble of creating such dummy units. In the future, they may be used to make fake Android-based iPhone 8 clones that you’ll need to stay away from. At first sight, these may seem like legitimate iPhone 8 leaks, but they do contradict many iPhone 8 rumors. The handset will not be made of aluminum. Instead, it’s expected to be made of glass, as the phone will support wireless charging. The antenna lines are also going away, a direct result of the all-glass design. Instead, we’ll probably have antenna bands on the iPhone 8, in iPhone 4/4s fashion. Other inconsistencies include the size of the standby button, the position of the camera flash, and the fingerprint sensor’s location.